I’m very proud of myself for actually getting my seeds started on time! Last year I was so busy, I ended up just buying all my plants. But it was EXPENSIVE! So here’s my setup. All the plants in round pots are for my veggie garden, and the square ones are flowers for the front garden bed. I’m starting kale, collard greens (my new experiments), tomatoes, peppers, and some herbs. 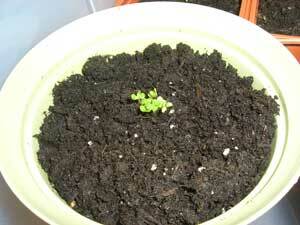 I was AMAZED because I planted these on Thursday, and nearly half had sprouted by the following Tuesday. All my tomatoes are up, as are the cabbage family. The peppers take longer–sometimes up to two weeks. I was also able to plant some things outside. I’m running into trouble–some of my grids are breaking. 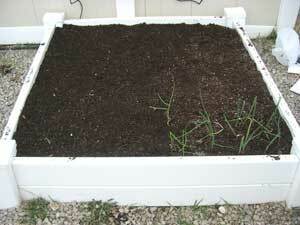 I’m at least one short, so I took one from a neighboring bed, and planted my onions. Then I put it back. 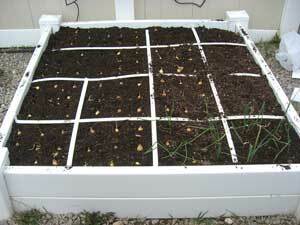 Since I planted the entire bed at once, I have no need to differentiate the squares. 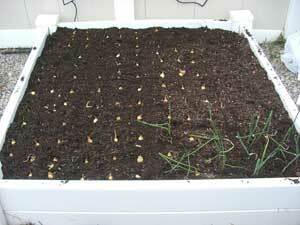 I planted mostly yellow onions, some red onions, and a few transplants I bought for cheap. I took some pictures so you can see–it would be pretty hard to get the onions spaced this evenly . . . Without using this . . . The final product . . .
Make sure your grow lights are not on too much (more than 14-16 hours). Then add a fertilizer with Phosphorous (N-P-K), which is the middle number. I like fertilome blooming and rooting. Can anyone help me? My pepper(Bell and Jalapeno) seedlings are on their 2nd set of true leaves and the top of the leaves are turning purple! They still look healthy but changing color. My plants did not do this last year. They are under a grow light and I keep the soil moist. Does anyone have any thoughts on this? When it comes to starting seeds–be sure to use quality seeds. If you bought Burpee you’ll be okay. But those seeds that are 10 cents a pack at Wal-Mart are garbage. 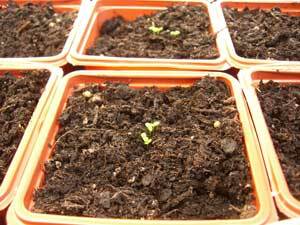 The germination rate is like 10%. Second, use a good “soil”. If you bought a kit, you should be fine on this. Third–keep moist, but not wet. 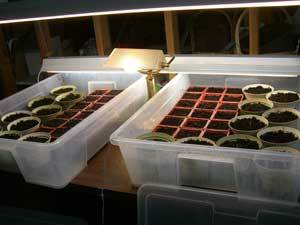 And finally, keep them warm, about 65 to 70 degrees F.
Some seeds do take longer–peppers take 14-21 days. I would not start carrots, peas, green onions, or beets in trays. 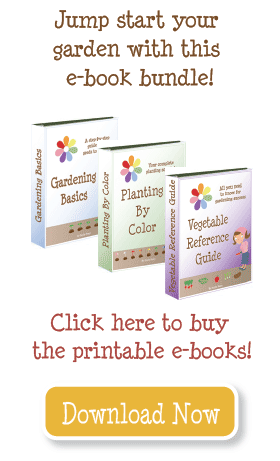 Plant them directly in the garden. Have you signed up for my newsletter? It will tell you when to start what, depending on where you live. If you figure out your Planting By Color group I can be more specific. Hi Emily! Th garden looks great! My husband and I are starting our first SFG this year. We started everything from seeds (inside) so far and have had a pretty measly turn out :-(. Actually that’s why I came to your site to see if you had a post on this and voila! You did. We are planting kale, carrots, peas, peppers, green onions, cucumbers, beets, eggplant, broccoli. Ok that’s all I can think of. We started them in burpee seed trays about 1 week ago. One tray was erroneously over watered but I took extra water out. And we JUST got a light on them a few days ago. We have probably 10 little sprouts out of 144 slots. Any suggestions or ideas why they might not be sprouting? I’ve enjoyed your post on SFG. Thanks for the info! I started my seed planting this past weekend. I was excited to see a few sprouting already. This is the first year I am starting from seed and starting this early lol. I usually have to buy the plants because I always get behind and its too late to start from seed. Glad to see your post on your garden. Makes me feel like I am right on track with starting my seedlings.